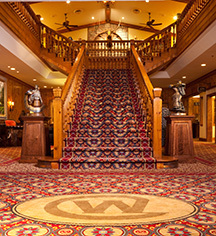 The Wort Hotel has been a Jackson Hole landmark since 1941, when John and Jess Wort carried out their father’s dream of opening Jackson’s first luxury hotel. With its Tudor Revival architecture and rustic interiors, The Wort Hotel quickly became a central gathering place, where one might spy community leaders, skiers, cowboys, visitors, and locals. 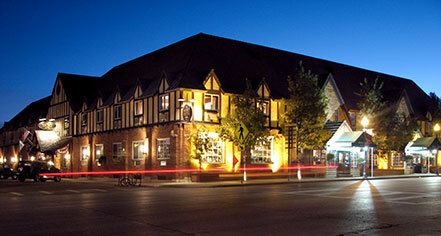 The Wort Hotel combines the intimacy of a fine western lodge with the exceptional service of a grand hotel. The hotel boasts spacious guestrooms and suites, each individually appointed with warm New West décor, making it the perfect retreat after a day spent playing in the mountains of Jackson Hole, Grand Teton, and Yellowstone National Parks. Located just steps from Jackson Hole’s historic Town Square, The Wort Hotel is central to Jackson’s finest restaurants, nightlife, galleries, and shops. Across the street are the Wort Plaza Shops, a collection of boutiques including a hair salon, galleries, and a coffee shop. The Silver Dollar Bar, named for the 2,032 uncirculated 1921 silver dollars inlaid in the bar, features live music and nightly specials. The Silver Dollar Grill features sophisticated mountain cuisine in a casual, family-friendly atmosphere. The Wort Hotel, a member of Historic Hotels Worldwide since 2017, dates back to 1941. The famous Silver Dollar Bar features 2,032 uncirculated 1921 silver dollars along the length of its S-shaped mahogany bar top. Adjoining Rooms: Available only with two bedroom suites. Cancellation Policy: Cancellations prior to 14 days of arrival are fully refundable. Within 14 days of arrival, reservations are non-refundable. Deposit: Stays of two nights or more require two night deposit. One night stays require a one night deposit. Parking: Self-parking: Available. Valet parking: Available. RV, bus, truck parking. The Wort Hotel has been a Jackson Hole landmark since 1941, when John and Jess Wort carried out their father’s dream of opening Jackson’s first luxury hotel. Learn more about the History of The Wort Hotel .